WASHINGTON — The rallying cry from some liberals to abolish Immigration and Customs Enforcement isn’t a likely winner this election year, as a new poll finds only a quarter of Democrats support eliminating the agency that carried out the Trump administration’s policy of separating immigrant children from their parents. READ MORE: What’s driving the movement to Abolish ICE? 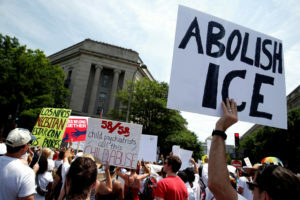 What’s driving the movement to Abolish ICE?